If there was an award for a city that takes full advantage of the summer season, we’d give it to Chicago. Once the winter’s snow has melted this city heats up in full-force, making it one of the world’s best places to go out – with your friends, your date, or even your parents (we tried it!) – and enjoy your favourite drink or two. From beach parties to raging city parties to boat parties, to weekend-long-festival-parties (hello, Lollapalooza), there’s a spirit that’s undeniably contagious. Also famous for its food, Chicago has a lot more to offer than just the Midwestern comfort food it’s known for – foodies will love the unlimited ethnic restaurants nestled throughout the city. As for neighbourhoods you can’t miss, Wicker Park has the best vintage shops, independent boutiques and trendy eats. Pilsen is also worth checking out – this up-and-coming south-west side neighbourhood is sure to bring out your artistic side as you’re surrounded by bold murals and the lively, creative spirit of the area. At The Drake, Chicago’s famous 1920s hotel on the Magnificent Mile, you’ll feel like you’ve stepped back in time as you’re dazzled by the high ceilings met with crown moulding and grand chandeliers. A stay in this high society palace will make you feel like one of Chicago’s elite. Join Princess Diana, Frank Sinatra and Marilyn Monroe (whose initials, alongside Joe DiMaggio’s, are still carved into the bar of the Cape Cod Room) on the roster of the Drake’s A-List guests. Soho House’s newest location in Chicago’s West Loop is a must for those chic and cultured travellers. The industrial bones of the 110-year-old building met with the intricate design and character – that only the Soho House brand can create – is why we love this hotel. For a panoramic view of Chicago, check out the rooftop pool bar where you can swim on a hot afternoon, or cuddle by the fire on a chilly evening. But the best part about a stay at Soho House Chicago is access to the private members club, where you’ll mingle with the club’s interesting and creative-minded members. When we want to step off the beaten path of Chicago’s downtown, we head to Holiday Jones upscale boutique hostel. Burrowed in the ultra-hip and cool Wicker Park neighbourhood, you’ll be guaranteed good vibes and even better company. Not your average hostel, Holiday Jones – a stay that provides the five-star hotel experience with hostel pricing – places you in the midst of art galleries, live music, clothes to be thrifted, and all the coffee, beer and cocktails you could ever want. Not sure about hostelling it? Don’t worry, both private and shared rooms and bathrooms are available. One of our favourite things about Chicago is the stunning skyline. 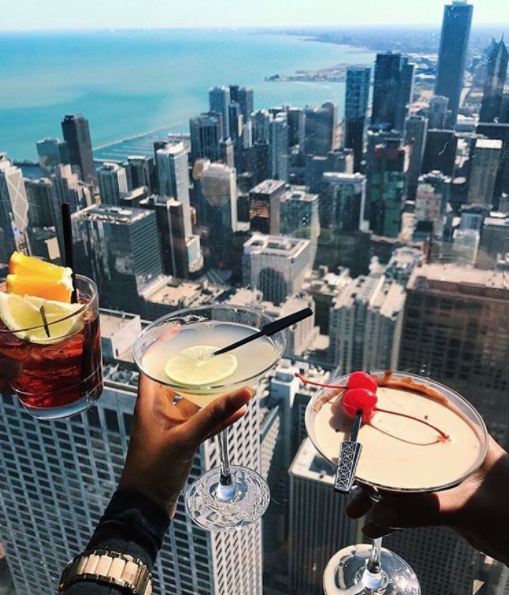 So why not enjoy your drink of choice with the best view in the city? The Signature Lounge, 96 floors above the John Hancock Centre (yes, that John Hancock) is a must when choosing a bucket-list-worthy drinking spot in the city. Try out our favourite cocktail, the Signature Room Punch, or choose for yourself from the extensive specialty cocktail menu. Well worth the extra cost, you can also enjoy fresh, local cuisine while sipping in style and taking in the unbeatable view. For a night spent drinking alongside the picturesque Chicago River River Roast is a must. The truly unique drink menu features cocktails titled Illegally Smuggling Ginger and Morpheus is Fighting Neo, as well as a number of fun craft beers. Drinks aside, our favourite thing about River Roast is the vibrant atmosphere. Don’t be surprised if you see a group of young Chicagoans pulling up on their boat and hopping over onto the patio to keep the party going in their private booth. For the city’s secret best cocktails you’ll want to head to Sparrow – a local classic nestled in the Gold Coast neighbourhood. This old-school establishment radiates the vibe of Chicago’s iconic hotel lobby bars. Known for their rum cocktails, we recommend the Twelve Mile Limit a rum and rye focused cocktail with French cognac, pomegranate grenadine and lemon. If you’re looking to keep the party going after Sparrow closes, we suggest you head over to one of Chicago’s infamous 4 a.m. bars, although Sparrow itself stays open until 3 a.m. on Saturday nights. Chicago is a city that’s famous for its deep-dish pizza. As pizza lovers ourselves, our favourite deep-dish spot is a classic, Lou Malnati’s Pizzeria. If you’re already crossing this authentic Chicago must off your bucket list, you should probably try the Malnati Chicago Classic, which layers lean sausage, extra cheese and vine-ripened canned tomatoes over a garlic butter crust. Need we say more? You’ll find Schwa on the fringe of the creative and cool Wicker Park neighbourhood, just outside of Chicago’s downtown. The culinary artists under the direction of Chef Michael Carlson make all dishes at this foodie heaven into a work of art. The menu allows you to choose your own serving sizes, as you’ll be getting fed grasshopper portions of delicately plated meals. 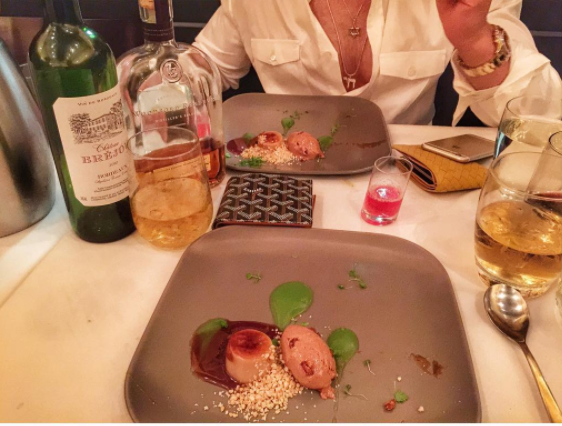 There is also an option to BYOB – just ensure you make a reservation, as they won’t seat you without one at Schwa. Known for its infamous after-hours, 4 a.m. bar status, Butch McGuire’s has a reputation for being a party hot spot in the Gold Coast. What most people don’t know is they also have amazing pub fare. If you’re looking for great food and that won’t hurt your wallet, we suggest heading to Butch McGuire’s Irish pub for some fish and chips, baby back ribs or our favourite, the Butch’s Burger, topped with bleu cheese, grilled onions and mushrooms. We love the Magnificent Mile because of the big-city feel you get on this upscale stretch of Michigan Ave. For the full Chicago experience, stroll down Mag Mile and find the best dining, shopping, entertainment and architecture. You’ll eventually hit Millennium Park, another one of our favourites, which is home to the famousCloud Gate sculpture, better known as “The Bean”. You probably have a Facebook friend (or five) who’s taken a picture in the reflection of this architectural phenomenon. So don’t forget your selfie stick, because you won’t want to head home without your own rendition. You’ll know when you’ve arrived in Pilsen, as this Mexican-American south-west side neighbourhood definitely has its own distinct sense of place. We love the vibrant murals and public art that’s wrapped around every corner and hidden in the most unlikely of places. Visitors will find galleries and studios, independent coffee shops, vintage boutiques, and of course ample spots to indulge in authentic Mexican cuisine. Pilsen is also home to the National Museum of Mexican Art, a cultural institution we’d rate as a must-see. If you’re headed to The Windy City you better pack your workout clothes. Chicagoans are very active and can be found running, biking and rollerblading around the city. For visitors, one of the best (and most fun) ways to get around and see all the city’s sites is by bike. For bike rentals, we recommend trying out Divvy Bikes. There are thousands of Divvy Bikes situated around the city for rental easily with a credit card (costing USD$9.95 for a 24-hour pass). We love this tour because of the stunning views the 90-minute boat ride brings. Whether you’re an architecture buff or not, you’ll probably love it too. You’ll sip a cocktail and listen to the unique story of Chicago’s history while cruising down the Chicago River with the seamlessly architected city towering on either side of you. This tour is a must for visitors and locals alike. Unsure how you’ll make it around to your top choices of the city’s 77 neighbourhoods? Get acquainted with the L. Chicago’s elevated rapid transit system runs 24-hours a day and will help you get from point A to point B. The L is a great alternative to taxis and Uber, with adult fare only amounting to USD$2.25. That said, if you’re in a hurry we suggest ridesharing with Lyft or Uber as it can take a while to get around on public transit in the big city.